There’s a good chance that you can remember your grandmother or grandfather house cleaning. Grandparents tend to keep the house cleaning process fairly straightforward. All you need is a bucket, a scrub brush, and a whole lot of bleach. Maybe a full gallon or two splashed around the entire house. When you walk through your local grocery store, you’ll find an entire aisle full of home cleaning products. Every product claims to do something different and vital and highly specific. But your grandparents might have had it right. Bleach is an old-fashioned remedy that can help you clean just about everything inside and outside of your house. You can even use it in your garden. Today, people are most likely to put bleach in their washing machines. It gets stains out of clothing better than any other substance. But clothes aren’t the only items that bleach will work on. 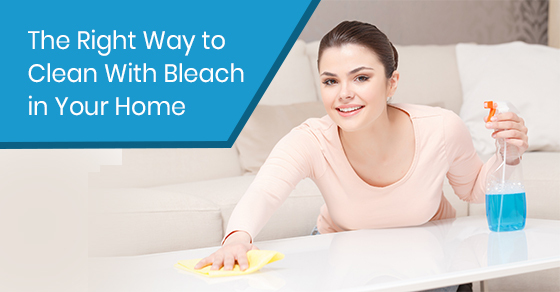 An entire home cleaning can be accomplished using bleach. It’s a more economical solution than using a dozen different bottles of highly specific cleaners. If you’re ready to clean like your grandparents, roll up your sleeves, and go back to the basics; these are the house cleaning tips for bleach use. These house cleaning tips have been compiled by experts. Even though the most common use for bleach is brightening your whites, you can also use it when you need to sanitize your laundry. For example, you might need to do a deep clean of your baby’s clothes or your own gym gear. When you’re looking for a deep clean, it’s important to add slightly more bleach than you usually would. In a standard washer, that’s 2/3 of a cup; in a high-efficiency washer, that’s 1/3 of a cup. What many people don’t realize is that, depending on the method used to apply the dye, a great number of coloured clothes can also be washed with standard bleach. Before you do a full wash, experts recommend that you test a small and discrete part of the fabric with bleach. You should mix two tablespoons of bleach with 1/4 of a cup of water. Apply a small dot to the fabric, let it sit for about a minute, and then blot it dry. If there isn’t a stain, it’s okay to wash the garment with bleach. Chances are, you have a good number of different kitchen cleaners. One cleans the sink, one cleans the counters, one cleans the windows, one cleans the stove, etc. The potential list goes on and on. But as long as you’re willing to take the time to mix your own solution, bleach will fit every cleaning necessity in the kitchen. If you want a basic formula to use everywhere, you should mix 1/2 of a cup of bleach with one full gallon of water. This is an effective disinfectant on your floors, refrigerator, tiles, sinks, countertops, stainless steel appliances, and any other hard surfaces in the kitchen. If you’re disinfecting your plastic trash can, you’ll need your solution to be a little stronger. Mix 1/2 of a cup of bleach with 3/4 of a gallon of water. Meanwhile, plastic cutting boards should be cleaned with a diluted solution: two teaspoons of bleach mixed with a full gallon of water. Travel mugs are often forgotten in the cleaning process, but they gather so much bacteria in their tricky lids and corners that they can benefit from bleach cleaning. If you mix two teaspoons of bleach with a full gallon of water, soak both the mug and the lid in it for two minutes, and then rinse it well. Then you’ll have a disinfected mug that’s safe to drink from. No matter whether you’re focusing on the floor or the ceiling, the mirror or the wall, the sink or the toilet or the shower, bleach is the deep-clean solution that will destroy nasty bacteria. When you’re cleaning your standard surfaces, like your tiles and toilets, you can use your standard bleach solution. But experts have recommendations for some trickier bleach applications. If you want to save the mouldy shower curtain you found in the landfill, you can put it in your washing machine with basic detergent, along with 2/3 of a cup of bleach. This will kill the bacteria already on the curtain, clean the mould away, and prevent the formation of new growth. You can disinfect the plastic bath toys that your kids play with. Just mix 1/2 of a cup of bleach with a full gallon of water. Let the toys soak in the solution for five minutes, and then rinse them well in the sink. If you’re finding mildew and mould on your floor tiles, you can mix 3/4 of a cup of bleach with one full gallon of warm water. Use this solution to wipe down the entire surface. Let it sit for ten minutes, and then rinse it with unbleached warm water. Chances are, you can only use your patio a few times a year. But that doesn’t mean you shouldn’t enjoy it! If anything, you should get the most use out of the space while you can. Plastic patio furniture will often become dirty and full of cobwebs. It’s easy to clean it, though, if you mix a gallon of warm water with 3/4 of a cup of bleach. You can then wipe the solution over the plastic, wait for ten minutes, and then rinse the furniture off with warm water. Please note: Be careful that you keep runoff from going into your garden! Bleach can be detrimental to your plants. Even though it’s bad for plants, bleach can be good for your planters. If you want to refrain from giving your plants diseases or mold, you can clean out your pots from the last year with a mixture of 1/2 of a cup of bleach along with one full gallon of water. After the pots have been left to soak for five minutes, you can rinse them and let them air dry. For more information, call Sunrise-cleaning at 289-814-1824 or contact us here.